In 1962, the Ministry of Culture and Information classified Halong Bay as a National Landscape Site, covering an area of 1,553 km2 with 1,969 islands. Halong Bay has been recognized twice by UNESCO as a World Heritage Area for its universal values of landscape, geology and geomorphology, respectively in 1994 and 2000, an area of 434 sq. km. including 775 islands.The Bay’s Geological value is evaluated in two ways: by the history of its formation and its karst geomorphology. It is also home to the ancient Viet people beginning from 7,000 to 18,000 years ago, Ha Long’s Cultural − Historical value. Besides, Bio-diversity is an important natural resource, to be well-conserved so as to maintain the ecological balance of the whole region. Ha Long Bay is undoubtedly not only a national but also a world nature, a magnificient work of Natural Creator. People who are admirers of natural beauty should stand up, pack their luggages, and right away pick up a flight to Ha Long, or else they will soon feel regretful! Let's enjoy the Halong bay cruise 2 days 1 night trip with David Travel to have best experience. 07:45 - 08:30 Tour guide and shuttle bus of Halong Dragon Gold Cruise pick you up then take 3.5 hour scenic drive to Halong city. Have a break 20 minutes en-route to free your legs. 12:15 Embark Bai Chay Harbor, get transferred to Dragon Gold Cruise by a tender and enjoy a welcome drink. 15:30 Do kayaking among hidden parts and around Bo Nau Cave to discover mysterious beauty of Halong. 19:00 Have a delectable dinner in cozy restaurant of Dragon Gold Cruise in the middle of Halong. 20:00 Entertain evening by karaoke singing or try your luck doing squid-fishing. Overnight on Halong Dragon Gold Cruise. 11:30 Lunch is served aboard Dragon Gold Cruise. - In case of cancellation due to acts of God such as natural disasters, epidemics or flight/train cancel, Dragon Gold Cruise has no obligation to compensate any additional costs other than the refund of unused included services. 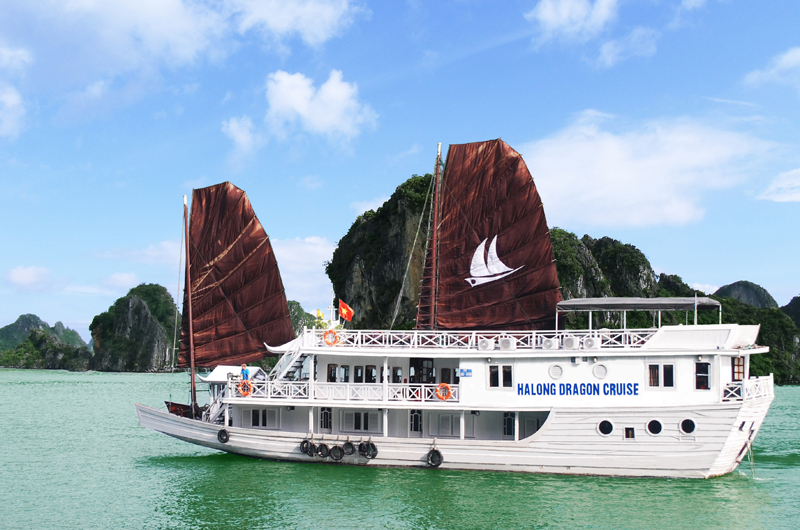 What do you think of Dragon Gold Cruise (2 Days/ 1 Night) Halong Bay?